August 20, 2015 ~ Lorra B. 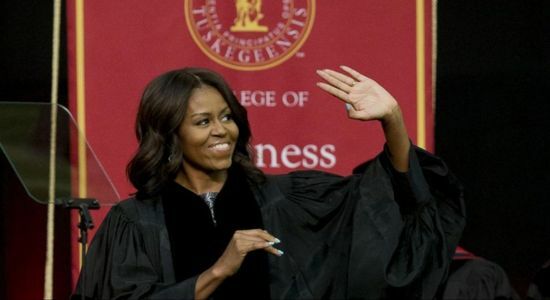 This entry was posted in Government, Marines, Military, News, Politics and tagged A Marine's letter to Obama, Conservative Blog Network, Marines, Michele Obama, Mike Shepard, Military, Racial tentions, Tuskegee University. Bookmark the permalink. She loves the adulation of the crowds. When one is so self-centered, the most minor barriers to one’s life of total pleasure is deemed caused by people of privilege. The United States had a short history of slavery, much shorter than African slavery on Africans, which still exists. Would life have been better for the Obamas if it had been lived under Mugabe, Idi Amin, or in Kenya? Racial division and hatred can easily destroy all the efforts ancestors of black Americans and bring society back hundreds of years. The struggles of the earlier generations of blacks so that their progeny could go to the world’s best universities and achieve the Presidency of our nation will have been in vain. Michelle, this Christian nation is attempting to correct our flawed human natures, don’t expect to see that in Saudi Arabia, Iran, Kenya, or Nigeria. We even tolerate displays of bossiness. An epic letter. That says it all. The Obamas know exactly what they are doing. They are a conniving couple, who initially set out on a sick, but well planned trek, which is the demise America, as we know it. Ever since he came into office, he has taken this nation deeper into sin. They have little, or no regard for us. They feel entitled, and who cares what happens to the rest of us. They would rather defend outsiders, than those who have sacrificed much. I have never witnessed so much narcissism, and self centered traits in anyone, as I have witnessed in these two. I pray they repent, but if they don’t, even though God is love, He is also a God of wrath. That’s my take on this. blessing.